Lighting can be one of the most important elements in setting your room’s overall tone and feel. At Savoir Faire Home, we like to think of lighting much in the same way as we think of artwork. Of course, there is a functional element, but it can also provide an impactful creative element. Lighting can be used in many ways – it can make a room look larger, it can be the most important focal point, or it can be used as something purely functional. Each chandelier or sconce should evoke a sense of its personality. Does it feel sophisticated? Is it fun or whimsical? Does the feel of the lighting change from day to night? For example, a crystal chandelier may feel sophisticated and formal during the day, but it takes on a much more romantic tone at night. The best room designs incorporate a sense of nature, and lighting should be no exception. Thoreau said it best when he wrote that “we can never have enough of nature.” Mixing materials such as natural wood, cut glass, rope and even seashells can bring the outside elements inside of your home to further immerse you in your surroundings. 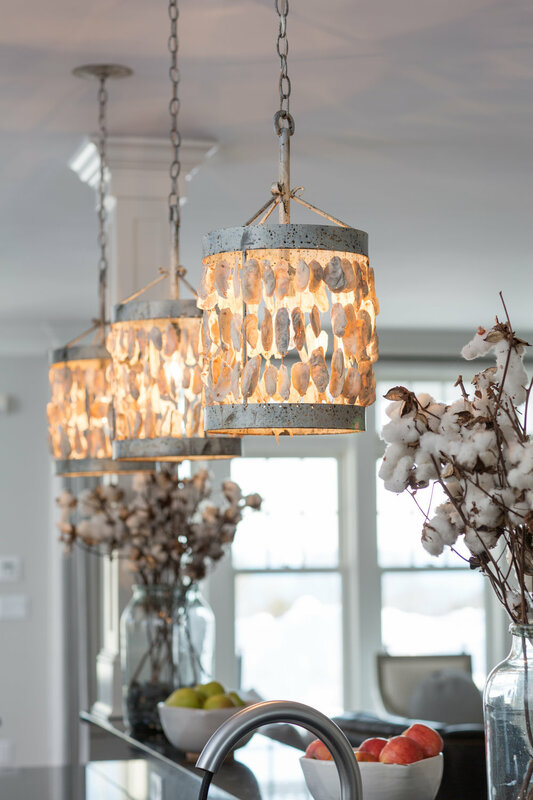 For a spectacular waterfront home on the Seacoast, we opted to use chandeliers made with oyster shells, quartz and natural hemp to draw in the outdoor setting, as shown below. We also used soothing colors that matched those of the surrounding landscape. We recommend pairing these different textures with a warm, soft light to emit a relaxed and organic elegance throughout your space. Size is also an important factor when considering different chandeliers for your space. Traditionally, if you are placing the chandelier above a dining table, the diameter of the light fixture should be one-half to two-thirds of the width of the dining table. While we appreciate traditional guidelines, current trends are leaning towards “bigger is better,” and we tend to agree. 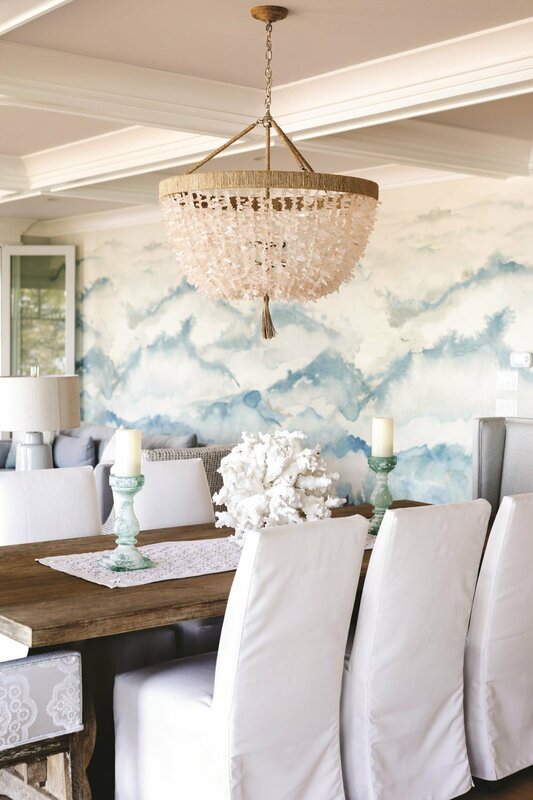 In the below beachfront project, we opted for an over-sized chandelier above the dining room table. The homeowners wanted a space that was ideal for frequent entertaining while also emitting a polished yet casual feel. Note how, even with the increase in size, we chose a chandelier that is open and airy rather than heavy and overpowering. This spreads the light flow across the table for a more intimate feel, rather than concentrating most of the light in the center of the table. Lastly, we aim to treat chandeliers as a supplementary light source, and often pair them with sconces, pendants or lanterns. Chandeliers should complement the other light fixtures in the room – they don’t necessarily need to match. 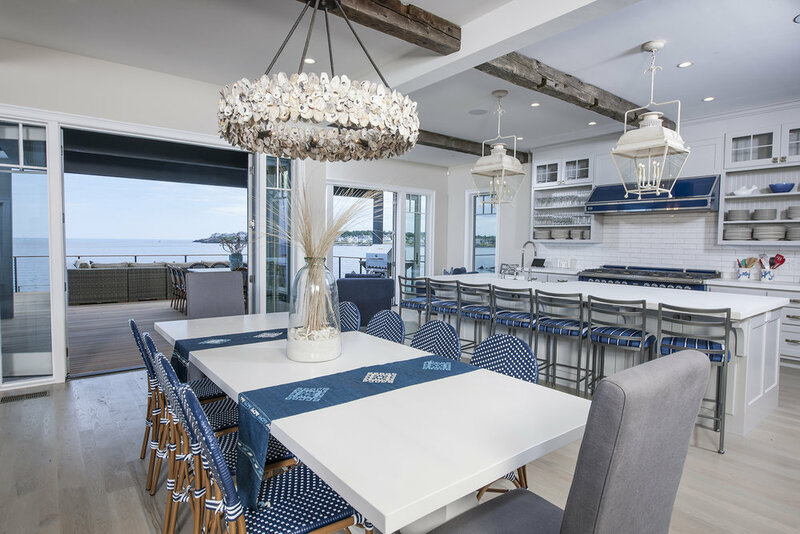 We frequently mix and match chandeliers, pendants and sconces, as shown below in a recent waterfront home project. 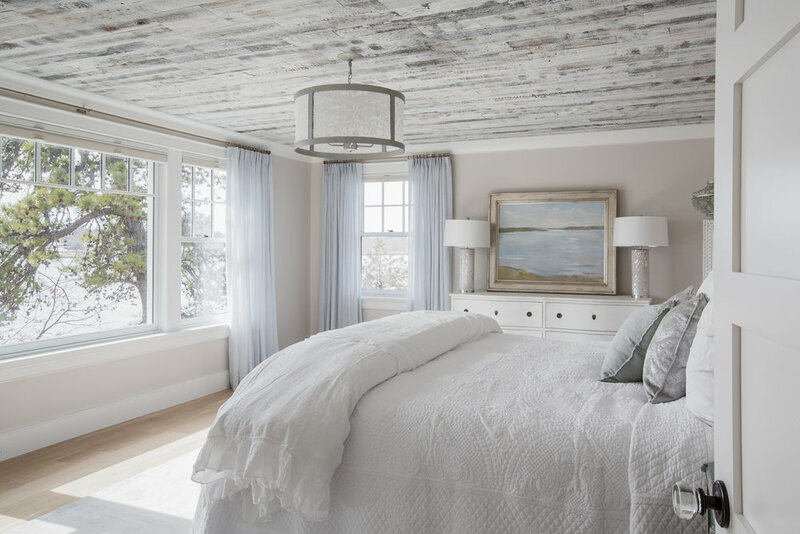 The goal for this room was to create a naturally calming atmosphere by using the same soft tones that the homeowners would see by looking out their window. Using predominantly light silver finishes with a semi-sheer white shade, we brought the colors of the clouds inside the Master Bedroom. The result is an incredibly serene, organic and multidimensional space that transcends the walls entirely. We also used this same technique in another waterfront project, this time in Maine. For this room, we wanted to accentuate the expansive view of the ocean with stimulating nautical details. The high ceilings in this open-concept space allowed us to use an ornate, shell-covered chandelier over the dining room table, which we flanked with oversized lanterns above the island. The two lanterns help to fill the space over the kitchen while also providing additional lighting to the secondary seating location. If you have been dreaming of adding a chandelier to your home, let this be your encouragement to take the next step. We welcome you to stop by Savoir Faire Home to view our collection of unique and interesting chandeliers and sconces in-store. We have a dedicated lighting designer who can assist in choosing the perfect fixture that speaks to you. Our Design Team sources from over twenty lighting vendors and routinely travels to High Point, Atlanta and New York to keep up with the latest industry trends. Come visit our expansive new Interior Design Showroom to begin your lighting search today!